Harrowing Halls is a Dungeon Tiles set for Dungeons & Dragons that takes the long-running line to new heights. 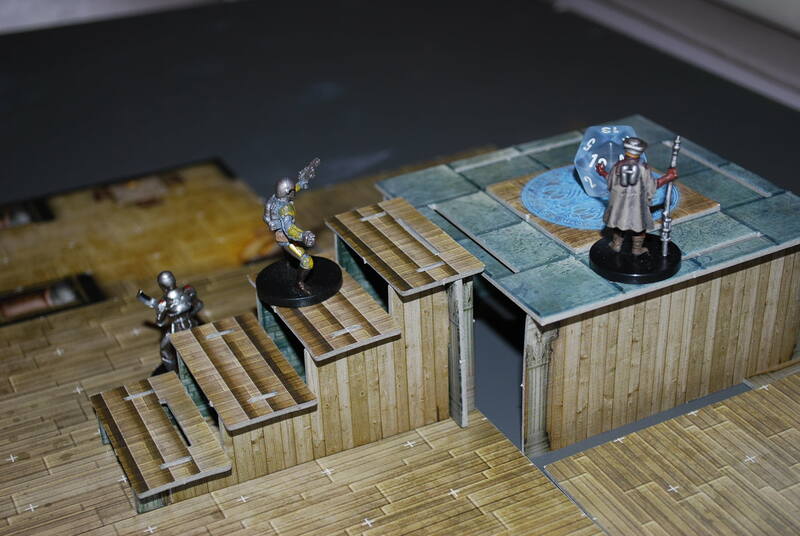 That’s because they’re not just dungeon tiles … they’re three dimensional dungeon tiles that can be used to build a staircase, raised platforms, tables, and pedestals, all of which player characters can jump on, leap off of and generally use to their advantage. It makes a big difference on many fronts, starting with prep time. I got a review copy of Harrowing Halls a few months ago, but since I run a weekly Star Wars game I haven’t had much call for a rustic hall/dungeon. That changed when I decided to run an epic showdown with a Jedi master in a temple on a storm-wracked backwater world. My big mistake was thinking I could set these up in 10 minutes before the game. Normal dungeon tile setup involves quickly sorting through what you have and laying them down. Then I’d cover them with a conventional battle map, and reveal them as part of the big climatic reveal. You can’t do that with 3D tiles, or at least, not easily, because you have to figure out which pieces go together. It’s a task that’s made all the more difficult because there are no instructions included with the tiles. I was able to quickly sort out some living quarters and a dining room for the Jedi, as well as a large, wide-open common room where the big battle would take place. I was able to quickly assemble the stairs that would lead to a large platform in the middle of the room, but the platform was another story. As the minutes counted down to the start of the game, I struggled to put together the structure, ultimately jury-rigging what I wanted, but it wasn’t entirely stable. It didn’t matter. 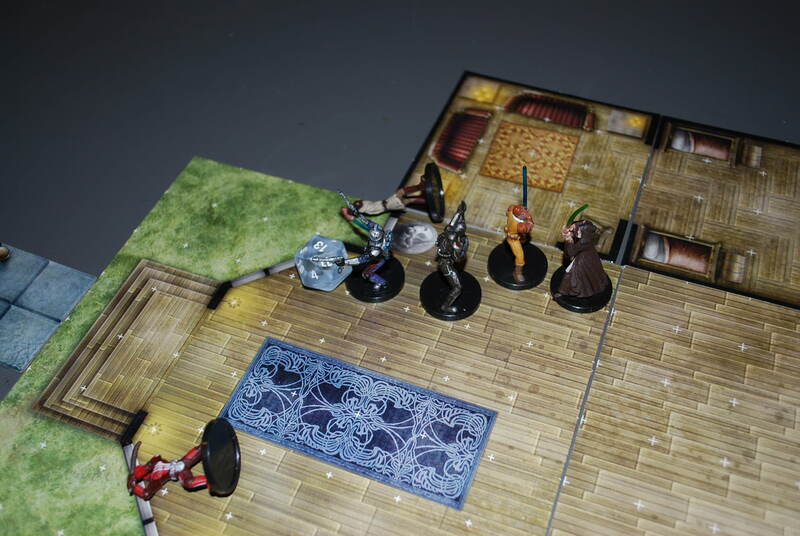 My players loved the extra dimension that the tiles gave our game, and I think it really added to the cinematic flair of the combat as the Mandalorians attempted to steal an ancient Force artifact and force the Jedi into battle. We had Jedi and Mandos fighting on the stairs, jetpacking from area to area, etc. The tiles themselves look fantastic, which isn’t a surprise — the cartography of the dungeon tiles has been first rate. You get several different rooms that can be used for offices and living quarters, as well as external tiles that can be used to create a small courtyard for the hall. The “hall” side of the tiles look like a rustic wooden temple/lodge, while the flip side is conventional grey stone. The set allows you to build a variety of multi-level platforms, tables and such, all of which are very cool. That said, it took sitting down for an hour, sorting through the pieces, popping out the little groves, and experimenting to figure out how to build the set pieces I needed. Once I did I could see a lot of potential with this set, especially when it comes to the sort of multi-level combats that my friends love to get into (whether its old school pirates sailing the Vohoun Ocean in Greyhawk or battling in a Jedi Temple in the Outer Rim). Was it reasonable to be able to expect to snap things together a few minutes before the game? Probably not … but with a simple sheet of instructions I probably could have pulled it off. Even with my haphazard assembly, the guys in my group liked the tiles — the artwork is first rate, the tiles look great and we liked the potential of the 3D terrain. The 3D effect isn’t something I’d want to use every game, but it’s well worth adding for special occasions.